Dragon Ball Z Kai (known as simply Dragon Ball Kai in Japan) was an effort from Toei Animation to take the original 291 episodes of Dragon Ball Z and slim it down to better fit the pace of the original manga. While doing this they also edited some older or broken animation/frames and restored them or completely reanimated them, as well as recording a new voice track and music score. The second season picks up where Season 1 left off (funny how that happens…) and continues to adapt the Frieza Arc, taking Dragon Ball Z episodes 57 – 104 and condensing them into 26 episodes. Our heroes are either on the planet Namek or on their way there, and are haunted by not only their former foe Vegeta, but the evil and merciless Frieza and his men. More trouble soon arrives as the Ginyu Force (or Ginyu Special Squad, depending on your pick of English or Japanese language) before the task of fighting Frieza himself. Without spoiling too much, this fight leads to Goku’s first Super Saiyan transformation, a standout moment in the series. In fact, the fight between Frieza and Goku is one of the most iconic showdowns in manga/anime history, and inspired many manga artists of today. My only little annoyance here is that the “season” ends just as Frieza is pretty much defeated, and in fact the arc as a whole ends two episodes later. I know they like to keep consistent with episode-to-release count, but would it have killed them to add two more episodes into the set rather than have the next “season” start with the last two episodes of an arc before moving to the next? Ah well. Much like the previous set, Kai is presented in the series’ original 4:3 aspect ratio, which is an improvement over the cropped and zoomed-in Z releases we got over here. Much like a lot of longer weekly anime series, Dragon Ball Z was animated by several different teams creating episodes alongside each other, which is never more apparent than here; the way the old episodes are cut up means that you sometimes see a sudden shift in art style mid-episode. It can be slightly jarring sometimes, especially when you throw in some of the newly animated scenes, but it’s not too bad. Voice wise, Kai continues to impress on both fronts. The original Japanese voice track still has all the now classic voice actors, plus some new ones in smaller roles, with accurate subtitles. The English dub is, unlike the dub of Z, very accurate and consistent, plus has a new voice for Frieza which is a vast improvement over the original’s old-woman-with-smoker’s-cough affair. The music track is another matter. When Season 1 was released here I was surprised to discover that it contained the new soundtrack made by Kenji Yamamoto, surprised because he was caught on plagiarism charges in March 2011 and the score has been subsequently removed from all versions of the show, including the Season sets in the States. I figured that Manga had used the half-season masters for our Season sets and that therefore the score would change awkwardly in the middle of Season 2, and sure enough that’s what happens here. Disc Three onwards switches to Shunsuke Kikuchi’s Dragon Ball Z score, with the exception of the lyric-less version of the opening and one or two new songs. It’s certainly a clash of styles going from one to the other, but after a few episodes into the third disc, you forget about it. The opening and closing songs remain the same, “Dragon Soul” by Takayoshi Tanimoto and ‘Yeah! Break! Care! Beak!’ by Tanimoto Takayoshi, including the English versions being sung by various FUNimation voice actors. New eye-catchers (pictures appearing before and after an ad break) appear through the set as well, minus the ads, obviously! Down to the purpose of any review then: should you buy it? Well, it’s the age-old story. Arrogant tyrant gets angry, tyrant turns into a purple-and-white all-powerful French mime form, people are killed, hero shows up, hero gets angry and his hair turns glowing yellow, all-powerful mime and golden-haired hero do battle. How many times in literature have we seen it? Seriously though, it’s the best animated version of one of the most iconic battles in Japanese comics, correcting the original Z‘s version by not extending the fight with endless recaps and slow panning shots of scenery. That being said, if you’re buying this then I presume you’ve already got Season 1 or at least plan to, and, given how this set ends, I imagine you’ll want Season 3 as well! 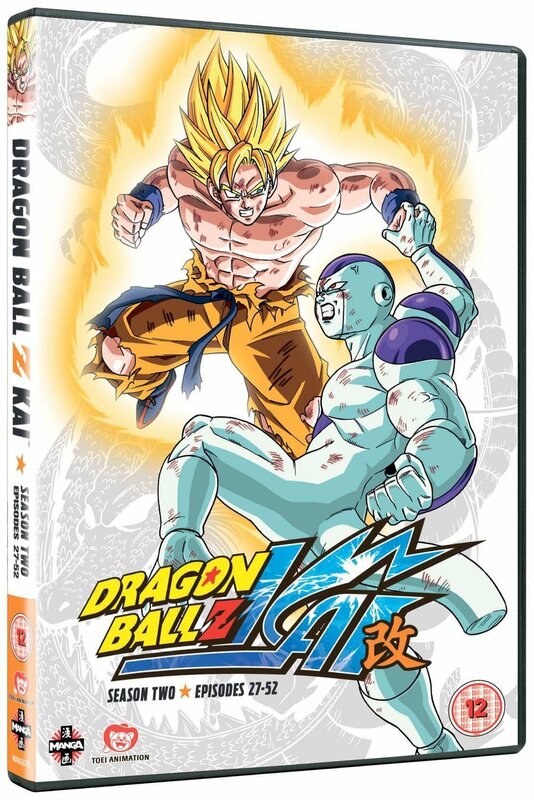 Overall, then, highly recommended to those who have yet to experience Dragon Ball Z, and still recommended to those who own the original series but are fed up of the climactic fight taking far too long.